Many things have changed along Woodman Drive over the years, but the Root Beer Stande has withstood the test of time for decades. Many things have changed along Woodman Drive over the years, but the little stand at 1727 has withstood the test of time for decades. 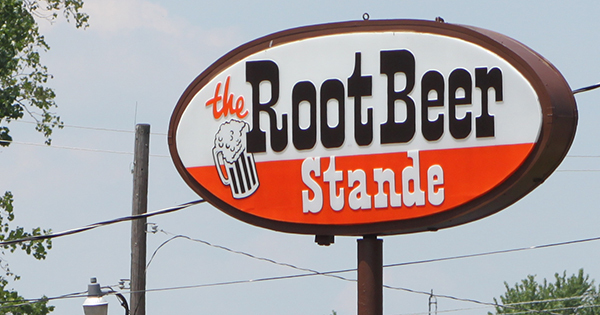 Many neighbors have come and gone through the area, but the Root Beer Stande is almost like an island lost in time. The concept seems much rarer today than it once was, but the little stande is a cruise-in eatery; you drive in and the servers wait on you at your car. Your order comes on a tray that attaches to the side of the door. Old favorites music plays overhead. Of course, you have to try the House Root Beer; while the place opened as an A&W stand, it got into making its own recipe and hasn't looked back. Myself, I'm a fan of the foot-long hot dogs, and I always have been; they're simple and pleasant; topped with a little chili and onions. There's no need to complicate an old favorite. The real story of this place, though, comes in the people who have patronized it for years, decades, even generations. You see a lot of people coming here who grew up on the place; having loved it as kids and now bringing kids of their own. The love for the place is palpable, and a quick hop on their own site shows the restaurant's great love for its fans as well. This is one Dayton establishment which simply must be experienced. Barring inclement weather, the Root Beer Stande officially opens for the 2019 season this Saturday, Feb 2, and will celebrate with 99-cent Root Beer Floats all day. Find more events like "Root Beer Stande Opens for the Season with 99-cent Floats"
Come out for a foot long!